This excursion is the presentation of our locality, it combines the beautiful landscapes with our history. We start with the Correntoso River where we can observe the trouts in their natural habitat and the crystalline water of the magnificent rapids. Then we take the 7 lake road and we reach the Inalco balcony from where we can see the last arms of the Nahuel Huapi lake, the Ultima Esperanza and Machete arm. We come back to the village, through the Green Lagoon Circuit (Municipal Reserve), an area of Environmental Reserve in full Urban Common land.After that we go to the Antique Villa and to Quetrihué's Isthmus, which presents the geographical accident that gives name to the village. There we will see the harbours: Bahia Mansa and Bahia Brava. Then we will continue along The Messidor Residence, the Building o the Nation Park, the Little Church an other work of our famous architect Alejandro Bustillo, who represent the architecture of the golden time of National Parks. We go through the Villa towards Puerto Manzano, where we will find a bay of incomparable beauty. This one is a place to make a stop and to enjoy the peace and the silence. We come back to the hotels. The forest is much more that an excursion, is a symbol of our town , and is in the end of the Quetrihue Peninsula that it is born in the port of the Villa and spreads over 12 km into Nahuel Huapi Lake and forming the Arrayanes National Park. The Arrayan is a common tree in the National Park but in the park there exists a real community of similar trees that in some cases exceed 650 years, enjoying the mountain chain frame beside the Nahuel Huapi Lake and of the majestic bays where we will find besides the nature the singular architectural beauty. We left the Hotel and we take the RN 231 towards Lake Mirror then we take RN 234: the famous the Seven Lakes Road (Mirror, Correntoso, Falkner, Villarino, Escondido, Machónico and Lácar). We are going to do several stops along this road. Our first Stop is in the Mirror lake. 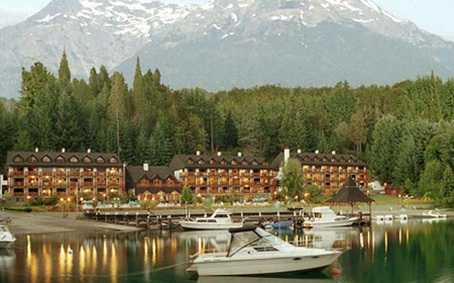 After that we are going to visits the famous 7 lakes hotel , where the Quintupuray family lives. 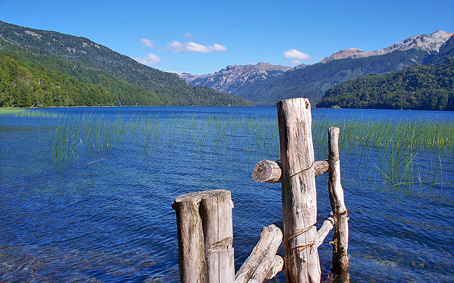 We will go by closely together of other lakes: Small mirror, Traful, Hermoso and Meliquina. A magnificent memory that the glaciers left us and that constitutes one of the most impressive landscaping of Argentina . The road surprises us in every moment with the beautiful views of mountains, streams, lakes, forests, silence. 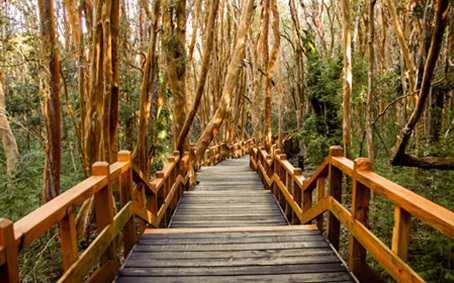 Several stops in the way, will allow us to contemplate not only the beauty of the landscape, also the smell of forest and the waterfalls sounds. In San Martin we will find a beautiful city beside the Lácar Lake, with spacious boulevards and streets with an architecture that combines the traditional made of wood, with the modern and functional design. We will have lunch in San Martin, that will be an excuse to stay for a few hours there, also will have the time for a walk. Then we will visit the Arrayan Circuit Viewing-point, with fantastic view of the Lácar Lake and Chapelco Ski Complex, before returning to Villa La Angostura taken the Seven Lakes road again. Full day excursion, Villa Traful is considered one of the favourits excursions of our passangers. This region is one of the most wonderful landscapes. We can see nature, archeological places, and a visit this beautiful Mountain Village surrounded of forest, creeks and its principal attraction: the Traful Lake. We leave Villa La Angostura and take the road on direction to San Carlos de Bariloche to reach RN 237 to Confluencia Traful. We are going to see the changement of the landscape: we see how the Forest starts to desapared and we go through the Patagonic Steppe. In this part of the trip we can see a beautiful view, product of many years of vulcanism and erosion in Rio Limay Valley, called Valle Encantado (Enchanted Valley). Then we get to Traful Valley to see the wonderful landscapes and its archeological remains. Before the Traful Valley we get to Cuyín Manzano Valley: a beautiful river surrounded of a huge wall of basalt, where, if we have good luck we can observe Condors that domains our sky. From there begins a valley of fertile lands and a microclimate that allows the agro-turist activity. Before we get to Villa Traful we arrive to the “Wind Balcony”, that is a cliff of glaciar origin that rises 70 meters over the level of the lake and allows a panoramic exceptional sight. After this stop, we continue our way to Traful. We arrive for lunch time to this Village of 500 habitants, which is hidden in the forest. Then we will continue the trip caming back for Seven Lakes road, across the magnificent Portezuelo, that takes us to 930 meters on the level of the sea. We are going to see the Mirror and the Correntoso lake, before we arrive to Villa La Angostura. 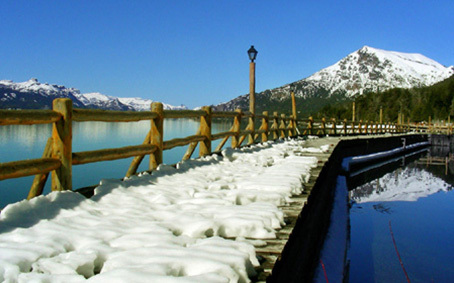 Over the right margin of Nahuel Huapi lake is Villa La Angostura, small, charming town placed in a wonderful landscape. This villa is well-known for its winter center Cerro Bayo, which is visited by tourists from all over the world who enjoy the ski slopes in July and August.